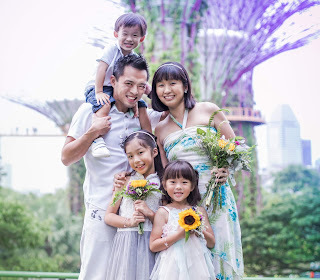 I get asked these question very often, be it from friends, family, readers or just strangers we meet on the streets, "You are out with three kids? ", "Where is your helper? ", "Are you sure they are all yours? ", "You mean you have two more kids other than this one you are carrying?" and "How do you even manage?". It's so much so that we've gotten used to it and the girls would also strike a conversation with these strangers, who are kind to us most of the time and would say things like "You all must be very good kids" or "It's not easy, you all must help Mummy okay?" I personally don't think it's a big deal because I have friends who have three kids or more so I think my brood is not considered big. Perhaps it is the sight of with an active, kicking baby on my chest and each of my hands holding another kid, the sight of me pushing two kids in a bulky pram and one on the kiddy board, the sight of me trying to look as cool as a cucumber when my kids act up in public or the sight of me appearing to be nonchalant when I should be flustered by the constant demands of these tiny beings. Anyway, I've been wanting to write about this for a long time and today, I'll be sharing with you on just what really happens when I bring the kids out for a meal. Since I've been doing it at least twice weekly for the past few years (we usually eat out after their enrichment classes and I'm quite happy about it because that means I don't need to cook), I think I have accumulated some experience and the truth is it still doesn't get all smooth and easy. It's the same and will always be the same as with every parenting challenge, right? I have three kids - aged 7, 4 and 1. Is it all rainbows and cupcakes when we have a meal - you know, that ideal scenario where you start off with appetisers, chat and bond with each other, savour the main dishes, talk about anything under the sun, finish up with dessert, foot the bill with a smile and walk off feeling like you just had a very satisfying meal? The truth is - I'm usually struggling to keep everyone in their seats (that is if we can find one), I'm doing ten things at a go and none of it involves eating my own food, my baby just pooped but it's so darn hard to go and change him right away when you have two other hungry kids to settle, the floor is in a huge mess because the baby just throws everything he sees, the table is all covered (except within 50cm radius of the baby) yet there doesn't seem to be enough space, the little girl is trying to be picky and discreetly leaves out the vegetables, the big girl is complaining of a tummy ache or that she needs to pee urgently, and it usually feels like everyone is looking at us because with 1A3C and a stroller, we are not the most usual, or quietest, group around. The fact is that some days are better than the rest, days when the kids seem willing to cooperate, when they are not picky and devour everything on their plates, when we manage to get seats without much hassle or waiting, when I don't spill any hot soup on myself, when I somehow manage to feed myself in between feeding the baby and helping the preschooler and nagging at the primary schooler, when the world seems to be a little kinder to this mum who chose to stay home with her three kids, who doesn't have a helper, whose hubby returns home past midnight on most days, and yet she bites off more than she can chew and still likes to bring the kids out on her own every so often. 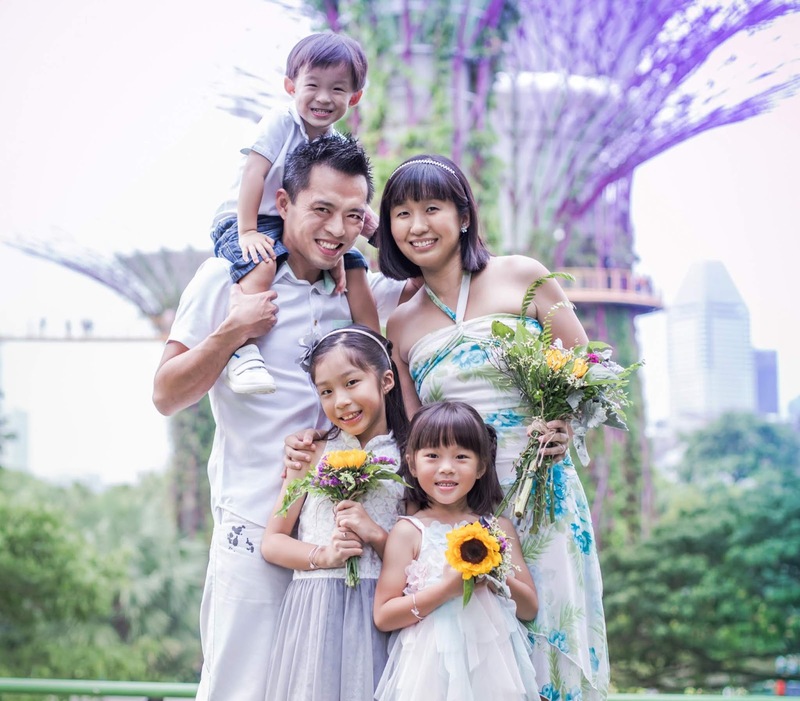 Read my 12 tips on travelling on the public transport with young kids here. So, I might not be good at many things like driving or reading maps but I can say with seven years under my belt, I am not too bad at dining out with kids. While I do lose my cool at times, I think the key to having a good meal with them is to learn to let go, to remain chill, to do it the ang moh way which is to breathe, relax, eat, smile and not fuss over every single thing that the kids do. 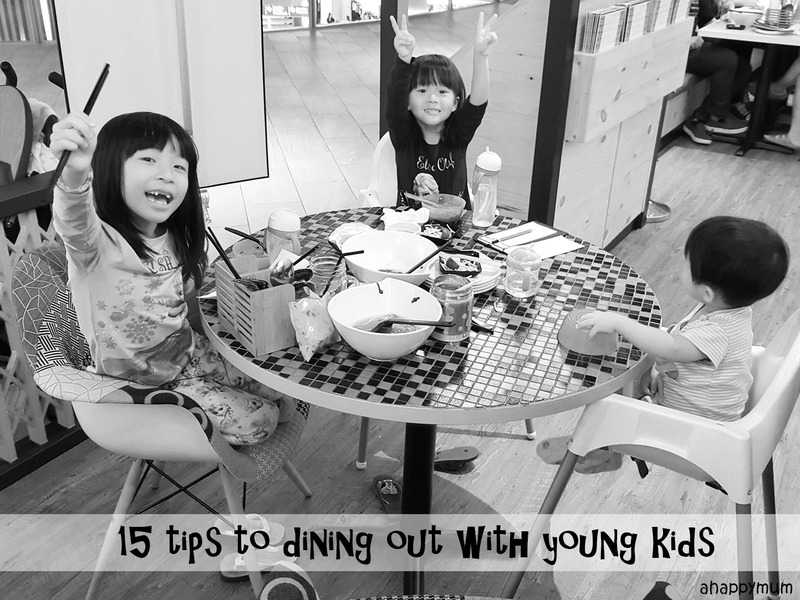 Here's sharing some of the tips I have for dining with young kids and hopefully they can come in handy for you too! I know, it's easy to say but hard to do at times. We eat at coffeeshops, hawker centres and food courts too (restaurants can get too expensive after a while) and sometimes, you are thankful just to get a seat even if it's tucked away in a corner. If you are lucky, it's near the stall you are ordering food from, but if you are not, you might just have to leave the kids for a few minutes while you dash to get the food. Yes, don't judge, I've done so umpteen times. No matter what, I always try to look over my shoulder and turn to look at them (hopefully they are in my line of sight and not blocked by pillars or other diners) just to make sure that they are still sitting there. I do train the kids, especially the elder ones, not to get off their seats, not to run around and not to talk to any strangers other than the cleaning aunties. If the queue is long, I take the baby with me to line up and order the food and when it comes, I first walk back to the seat to buckle him up in the baby chair or stroller before returning to the stall to take the tray of food. Right, eating at kopitiams is hard but not impossible! Always ask (and if you have to, force) the kids to go to the toilets first before going to eat. I can't tell you how important this is because I really dread to have someone telling me she needs to pee in the middle of the meal because that will give me a logistics nightmare (with the half eaten food, stroller, bags, barang and two other kids). Nonetheless, it does still happen once in a while so don't be afraid to ask the staff or fellow diners for help. I'm also training the elder ones to go to the toilet themselves (I don't mean pee by themselves because they can do that already, I do mean look at the signboards and find their way to the nearest toilet and then come back to the restaurant) so that I have less pee and poo issues to resolve during a meal. Don't get into situations where you run out of cash to buy food after you went through so much trouble just to get a seat. I've done this just once or twice (once I had to dig through my bag to gather all the coins and thankfully it sufficed to feed us) but it's enough to make me think about my finance situation every time and make sure that I have enough cash to buy what I need. This applies to coffee shops, food courts or places which don't accept credit card or NETS. Unless your kids are perfectly behaved, have the best table manners and mastered dining etiquettes, if not, it would be better to choose a place which is more kid-friendly. It doesn't have to always have a play area or cutlery for kids, but preferably it comes with high chairs, a kids menu and doesn't chase out kids who like to sing or talk a little louder (my kids sometimes sing Majulah Singapura when we eat). That said, you should never be afraid to try out new places. I, for one, like to take the kids to try out different food in different places. This is a trait different from the hubby who prefers to stick to the same old few places that we like and dine in most of the time. To me, nothing ventured nothing gained and if you don't try, you won't know! So, if you know of any newly opened restaurant, a new stall in your neighbourhood kopitiam, a new cafetaria in town, be brave enough to visit it the first time. If you don't like it, just don't go again. But if you like it, you will just feel so thankful that you now have another option in your list. This, to me, is preferred though not always possible. Whenever you can, avoid the lunch or dinner crowds because you just can't afford to wait too long with hungry kids. Moreover, the longer the wait, the easier it is for things to happen - like squabbles, tantrums, whines and toilet needs - and the quicker you will lose your patience. Set the rules that you want the kids to obey at mealtimes. For me, I don't like them to be picky about food and we also try not to waste food every time. Yup, I always recite 谁知盘中餐, 粒粒皆辛苦 if they tell me they can't finish their food. They also know that they need to stay in their seats instead of getting down and moving around because I need to be able to keep my eyes on them. This is the lifesaver for me. Honestly, I doubt I can do this if I have twins or triplets, but having the eldest who is six years older than the youngest, she doubles up and stands in when I need another pair of hands. Yup, the big girl helps us to look after our belongings, push the stroller when baby wants me, carry the baby when I need help, feed the baby so I can eat, watch out for her siblings and more. It's not that she is perfectly trained and the truth is being in the defiant phase of her life, she gives me another set of issues to handle as a mum but here's the thing, without her, I probably wouldn't be able to survive dining out with three of them so often. As for the four-year-old, she is also progressing and learning to ease Mummy's burden by eating on her own, taking care of didi and helping to carry stuff. Life doesn't always go the way you want it to. Sometimes, your favourite stall or the restaurant that your kids badly want to visit might be closed for the day. Or, you might need to do takeaways instead if you are rushing for time. Or, you might have forgotten to bring out the porridge for the baby and need to find a place with baby-friendly food or get food jars from the supermarket. Learn to be flexible about plans, don't panic and think of solutions in a calm, positive manner. Always explain to the kids for your course of action and let them understand what had to be done in that situation. No, I don't mean using electronic devices because we are the family who doesn't own an iPad, whose kids don't usually get to play with phones (the only game they play on mine is Cooking Mama and that happens like once or twice a month) and we also try not to sit near TV screens when we eat. To me, eating time is eating time and I would want us to eat happily together as a family and talk about the day's happenings. However, I sometimes bring along some colouring materials or let them read a book before the food comes. I've come to realise that once we cultivate this habit, the kids can actually find ways to entertain themselves (the girls always play games like scissors paper stone or I Spy) and it makes for a good bonding time for them as sisters too. Having a mealtime with three kids in a public place can be like fighting a war at times and it will be hard to emerge triumphant in every single battle. I've learnt to pick my battles on the things that really matter to me, for instance being respectful to elders and showing care for your siblings, and let go of things that won't kill me, for instance in letting the girls take off their shoes or in letting the one-year-old indulge in some french fries when he insists after seeing his sisters do so. Close one eye, take deep breaths and move on. Not everyone understands what a mum goes through when she takes her kids out for a meal single-handedly and not everyone will show kindness or compassion. I think up till now, we've done quite well in minding our own business and though we attract an abundance of stares, they are more of curious and astonished ones instead of alarmed or displeased ones. In any case, I'm learnt that the best way is to return stares with smiles or if you don't have the time, just learn not to be bothered by what others think of you. Here we are, trying to help raise the low birth rate of our country and let's just all agree that while giving birth might be fast and easy, raising a child is definitely not. So yup, I think mums have earned their rights to dine with their kids in a public place. Just try not to visit the Michelin-star ones till they are a little older, yar? Alright, we are not food connoisseurs and we will never be. When I am out with the kids, we are happy to just share two bowls of fishball noodles or two plates of chicken rice. To me, it's not the food that matters (okay, I do need food to make sure their tummies are filled) but the experience, the opportunity to be there to eat, chat and bond with the kids is what's important to me. The fact that the hubby is seldom home for dinner makes it important for me to be there with them, to show care for them, to talk to them about school happenings, to let them know how much they are loved day after day, meal after meal. Good behaviour at mealtimes can be rewarded and this is something that will help to motivate the kids. I'm trying my best to give rewards instead of dishing out punishments nowadays because I find that the latter only instills fear and not a willingness to be good. Wait, rewards don't mean toys or ice cream every time; what I do give is a run in the park, half an hour of play at the free for all playgrounds, healthy fruits for desserts or an additional bedtime story. As always, do more of it and you'll get better each time round. With the addition of each kid, I would always wonder "Can I still do it? ", "Will I survive bringing them out frequently?" and "Are peaceful meals a thing of the past?". It turns out that the answer was always I can, so long as I believe, I try and I don't give up. You know, I'm kind of scared that a day will come when I am eating all alone and the kids have no time for Mummy because they are all grown up and have their own lives. That will be the time when I will have all the time in the world to dine in absolute peace, to enjoy a cuppa and read a novel in my favourite cafe, to reminise about the good old times and wonder if I had cherished the times when my kids still needed me at mealtimes and think about all the fun and laughter, fights and tears, messes and clean-ups, up and downs we had. When that day comes, I hope my answer will be that yes, we had made the most out of every meal we ate together.